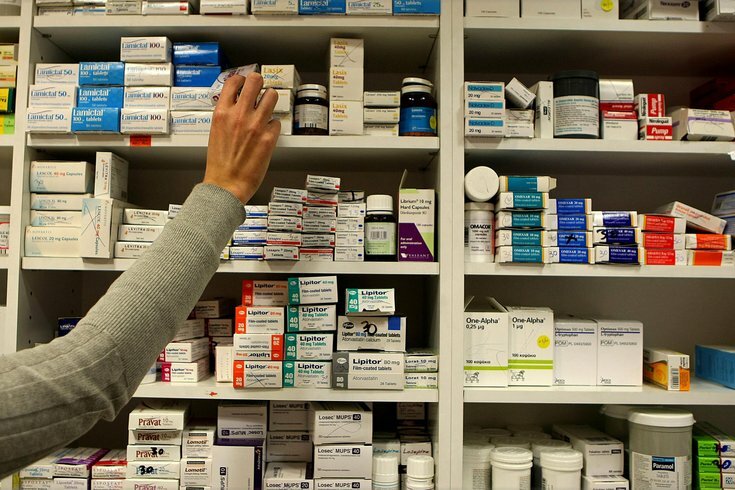 A pharmacist reaches for drugs in a pharmacy. Dermatologists are prescribing fewer antibiotics than they were a decade ago, but they continue to prescribe more than other medical specialties, and short-term prescriptions have increased. Dermatologists write more than 7.1 million antibiotic prescriptions each year, according to a study conducted by the Perelman School of Medicine at the University of Pennsylvania. Between 2008 and 2016, the overall number of prescribed antibiotics dropped from a rate of 3.36 per 100 dermatology visits to 2.13 per 100 visits. That represented about 500,000 fewer antibiotic prescriptions each year. Much of that reduction was attributed to fewer patients taking extended courses of antibiotics, a treatment commonly given to acne patients. The number of extended antibiotic prescriptions fell by 53.2 percent between 2008 and 2016, including a 28.1 percent reduction in antibiotics prescribed for acne. The longer antibiotics are used, the less effective they are. Over time, the medical issue they are treating builds up a resistance, making them less and less effective. While Penn researchers found long-course prescriptions declined, shorter-course prescriptions rose due to increased prescriptions associated with surgical procedures. Short-term prescriptions issued following dermatological surgeries rose by 69.6 percent between 2008 and 2016. Additionally, prescribing antibiotics for cysts increased by 35.3 percent. Researchers also found that the duration and type of antibiotic prescribed mostly remained the same, even though prescriptions became less common. The study, published Wednesday in JAMA Dermatology, examined a commercial claims database of privately insured patients.